Last year I discovered a holiday that celebrates the fun bright prints of Lilly Pulitzer. 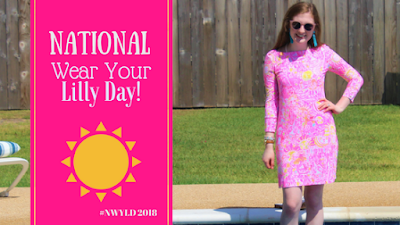 June 21, the first day of summer, is National Wear Your Lilly Day! The 'holiday' is a day for all Lilly Lovers to where their favorite Lilly items and celebrate summer! This year I wore this fun dress in Kinis in the Keys, isn't it cute?! It is one of the dresses featured in my Summer Clothing Haul. You can see what I wore for the fun holiday last year by clicking here. For my outfit I wore this fun Kinis in the Keys printed dress with my Jack Rogers Adeline sandals, pearls, and fun turquoise tassel earrings! Did you dress up for Lilly Day? If so, what did you wear?